Mute was designed to be just big enough to contain the batteries, motors, electronics, drive train and pneumatic system. As you can appreciate any excess space is wasting a portion of the 100Kg weight limit that could otherwise be used for armour or weapons. Mutes drive train simply consists of two gears, one gear mounted on the motor shaft and the other on the wheel. The wheel is mounted onto a fixed stub axle for maximum strength. To reduce friction on the axle the wheel is fitted with a brass bush as this is far easier and more reliable than fitting bearings and thrust washers. 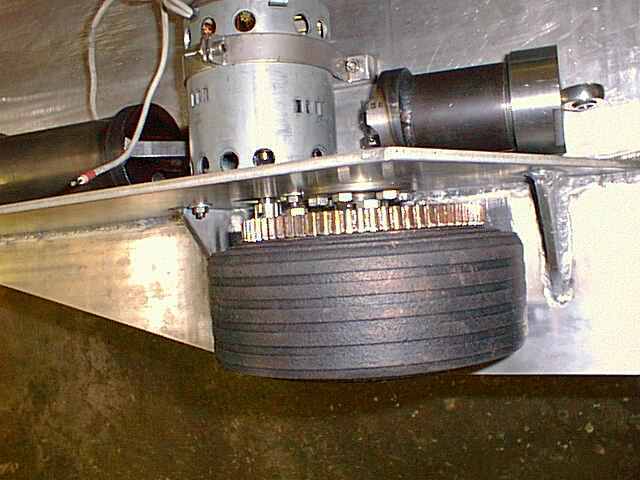 This is one of the two main drive wheels. 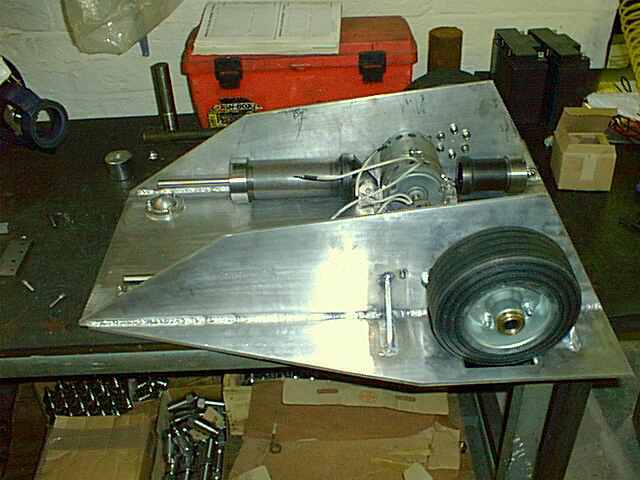 As you can see some minor weight reduction has been carried out to reduce the rotational weight from 5Kg to a mere 4Kg. Mutes pneumatic system is pretty much unique as the gas system consists of entirely high pressure valves without the need for low pressure triggers or a gas regulator. 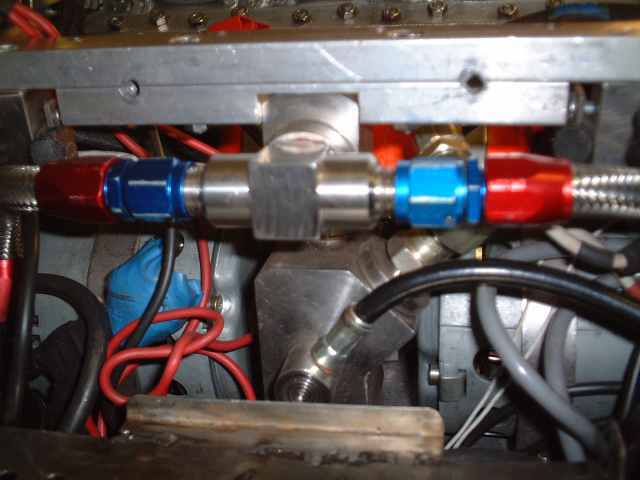 We use three valves to control the four pneumatic rams. The biggest problem with using liquid CO2 is pressure as ordinary pneumatic valves quite simply are not upto the job. 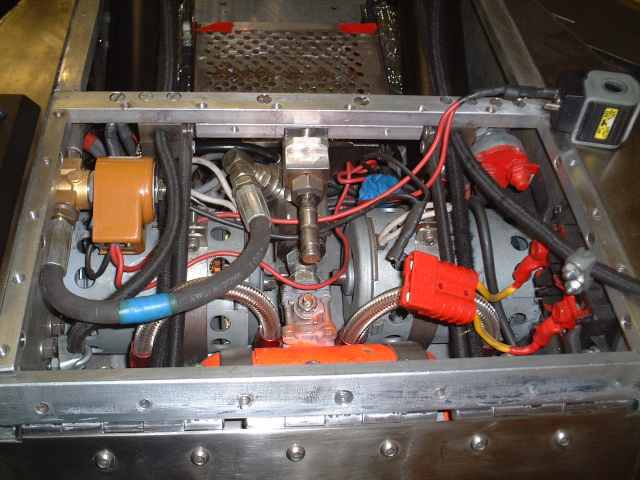 Mute uses two 2 way 3 port hydraulic valves to fill and exhaust the rams. These valves do have one draw back when being used with gas as they always have a small amount of leakage which is not really acceptable when you only have a small gas tank. To compensate for this we manufactured our own pneumatic shut off valve. Obviously we are not going to tell you how to make one, but trust me, they are very easy to make assuming you have access to a centre lathe and a basic understanding of how forces are applied. One other advantage of our shut-off valve is that it seems to prevent the main valves from freezing during operation, we have operated it around 500 times and the valves have not froze once. Mute contains four 50mm diameter pneumatic rams. They are basically full hydraulic rams with small rods to reduce weight. 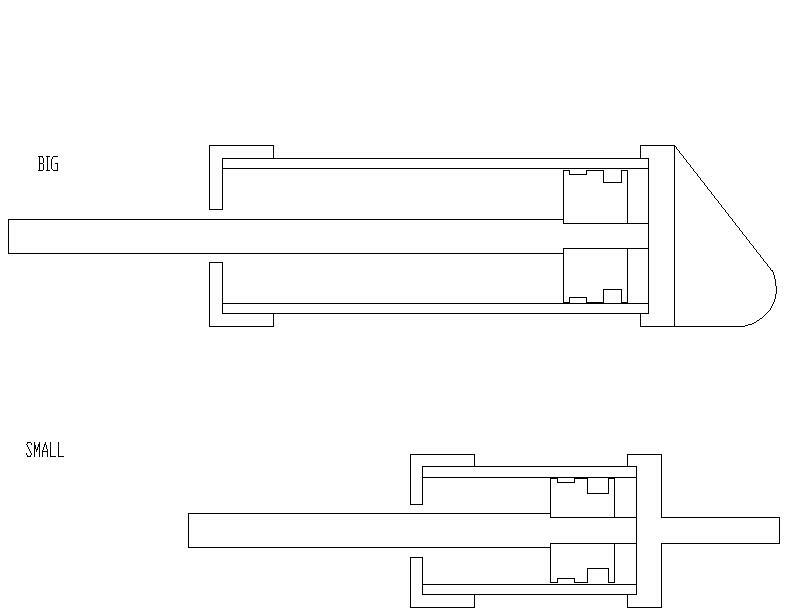 The front rams are approx 190mm long, and the rear rams are approx 90mm long. We manufactured the rams our selves, hence we could extract the maximum amount of travel for the minimum amount of space. Originally Mute used 64mm diameter rams at the front, but these proved too costly as their gas consumption was very high so we reduced them to a puny 50mm instead. 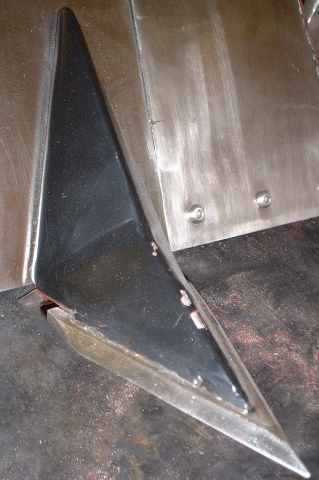 These are Mutes rear defence, there are three of them in total spaced out across the ream flipper. They are 6mm thick stainless steel machined down to a 2mm point at the tip, and provide some extra strength to the flipper to prevent bending when used at ramming speed. They should also aid the rear flipper to gain some grip on our opponents.